Abracadabra, “create as I say” in Aramaic, has been the power word of magicians for centuries. Today, when we tweet or blog, we all look for the power words that will grab the readers’ attention. What are they? This was the theme of a speech I gave to the class of Angelika Blendstrup in Stanford this week. Buzzwords: When you use buzzwords, you look like a blowfish puffing up to intimidate an enemy. Do you believe entrepreneurs when they tell you that their technology is a bleeding-edge, disruptive game-changer? They are actually saying only one thing: we are novices, just as the students who created this slang were when they believed they could fool teachers by stuffing their papers with all the expected words. Jargon, shoptalk or industry specific lingo: These words simply show that you are knowledgeable. So people in that domain take them for granted. And if you use them in front of people outside the domain, these words are obscure and disconcerting. Big words: They are all the words that make me feel stupid in order for you to look smart. Maybe they are power words for you. For me, they are just words I am unprepared to understand. Power words are not special words. Say “water” to somebody who is thirsty, and you are an enchanter uttering a power word. What is true in life is true for blogs and tweets. 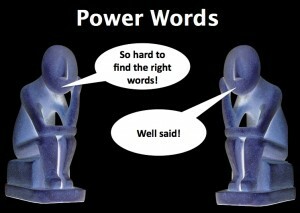 Power words are words that come across as strong and significant in a context. Grabbing people’s attention requires that you follow at least two of the basic rules for Web readability: scannability and sociability. Starting with the conclusion: Even though people scan texts, they still read the first lines so they can find out what they’re getting into. This is what Nielsen call the inverted pyramid, and is what most journalists actually have been doing for ever. Then, words start to jump out. Highlighting keywords, through hyperlinks, typeface variations (like italic, bold, underlined) or color: Select the words that you believe are important, and have what linguists call a keyness. Keyness is not the characteristic of a word, but the contextual weight of a word. So a word can have a high keyness in a text, and none in another. For example “French cooking” has a high keyness if you write about Julia Child, but has none in this present post. Creating meaningful titles and subtitles, and bulleted lists: They build up the framework for your keywords to act. … and be as concise as you can! Do not drown your keywords in a sea of weak words (tons of adjectives, synonyms for one word, or hazy adverbs). Power words stick to the mind of people when they get your point quickly – and they might remember your post if they write a post on a similar topic and link to yours. The Web is social in nature. Blogging is a social art, and obeys the rules of socializing. Words become power words when they foster adhesion and create adhesiveness — when they create a community around them. This is how some words have sometimes reached special status. Think of “unmarketing,” a time-stamped word by Scott Stratten, or of “enchantment,” rejuvenated by Guy Kawasaki. Google these, and you will see what I mean! Objective writing: Even though most blogs express a personal point of view, you want people to relate to what you say. As a result, soft-pedal on excessive statements. If you say that what you talk about is the “greatest, the fastest ever,” what are you going so say when you find out about something which is greater than the greatest or faster than the fastest? You build credibility over several posts, not one. Be descriptive as much as you can so that people can build a representation of the reality depicted by your power words. In the end, power words are words that make your reader participate in your story. They have an impact on people. They empower them – make them act (tweet or retweet, for example). … And can make them buy! That’s the case of blogs with a commercial purpose, a complex genre, where you do not simply address an audience, but also search engines. The whole point is to choose keywords that resonate massively, correspond to what people search on the Web at a given time. In this case, it is almost indispensable to leverage resources such as Google Adwords, Wordtracker, or Keyword discovery, or others. It’s also a good idea to seek the guidance of professional SEO copywriters or attend their training. There are a few books on the topic, such as The Copywriter’s Handbook: A Step-By-Step Guide To Writing Copy That Sells by Robert Bly, and also look for the one that SEO pioneer and goddess Heather Lloyd-Martin plans to release next year! Thank you for this article. As a novice blogger, I find myself spewing all the phrases you say to not use. It seems that, at times, I am a typing cliche factory that conveys an idea or argument improperly. I will use your article as a starting point for more study and training. Thanks. Excellent advice and not confined to SEO. For me the operative sentence is: “In the end, power words are words that make your reader participate in your story.” That applies to all kinds of writing—journalism, fiction, nonfiction. Such simple explanations but so powerful due to their simplicity and lack of pretension. Marylene, my English business writing students were very happy that you came and gave them a nudge in the right direction. I think as a result of your visit, some of them will start the blogs they were still keeping in their heads. Well said! A true portrayal of what you preach. More grace. Thank you for this. Sometimes the obvious is not so obvious until it is explained by another person. Plain speech trumps $10.00 words everytime.